Gliders are an essential part of a nursery, or so I heard. For Baby Z's room, we were on a strict budget, so we had to get creative in order to add a glider to her room. Thus, a DIY glider makeover was in order. Thanks to some JoAnn coupons, I was able to buy new fabric and thread for about $40 total. To keep costs down, I opted for a plain fabric on the reverse side of the cushions. 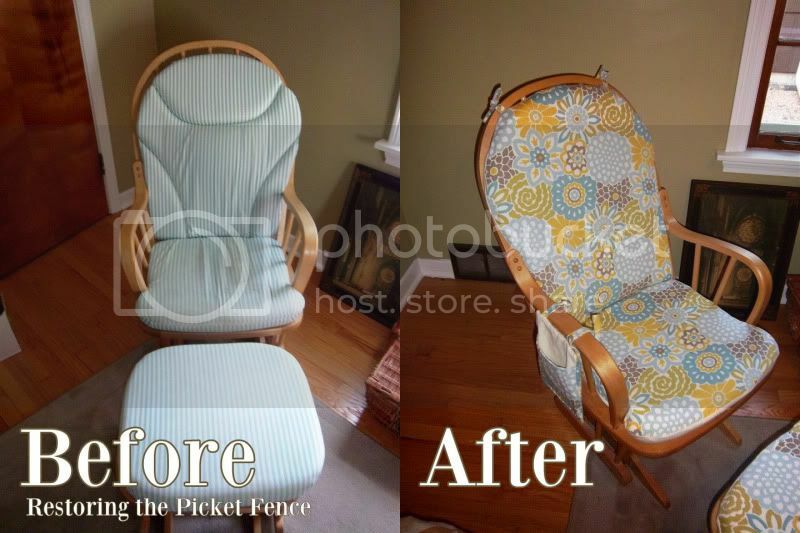 All the cushion covers are completely removable for easy washing. My favorite part is the little pocket on the armrest -- it's come in handy to store our tablet for late-night feedings (i.e. late-night Internet shopping) and extra pacifiers for emergencies. What sort of DIY projects did you undertake for the arrival of a new baby?